Rare and endangered plants and their habitats are presented and discussed by horticulturist Heidi Bornhorst and botanist Charles Lamoureux. 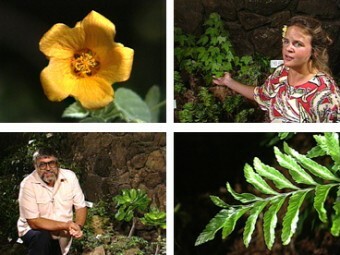 Plants include: ma‘o, ‘ihi, mā‘ohi‘ohi, māmane, pua kala, kulu‘i, uhiuhi, ‘a‘ali‘i, ‘ālula, ‘ilima, ‘ākia, ‘ōhai, ma‘o hauhele, loulu, ‘ihi‘ihi lauākea, hāpu‘u, palapalai, lehua mamo, koa, ‘ōhi‘a, ‘ie‘ie, ‘iwa, ‘alae, ko‘oko‘olau, pa‘iniu, naupaka o Pele, ‘iwa‘iwa o Kane, pā‘ū o Hi‘iaka. Produced for the Garden Club of Honolulu. Introduction by Mary Cooke.